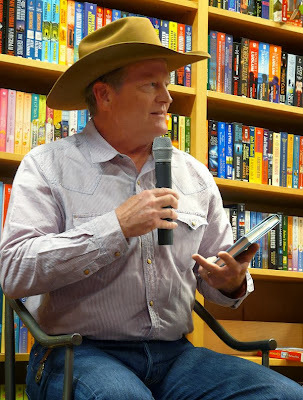 Saturday, October 26, a miffed husband was driving his rental car bus around Sky Harbor Airport while I jumped in the Jeep and headed southeast to The Poisoned Pen to see one of our all-time favorite authors, Craig Johnson. 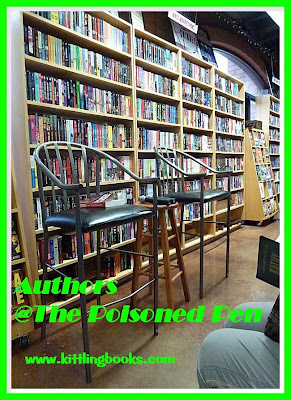 Sure, we'd seen him in June when he was touring for A Serpent's Tooth, but this author is so much fun I'd go to The Poisoned Pen if he appeared every week. Heck, if it wasn't such a drive, I'd head to his place in Ucross, Wyoming, to help him stack firewood, polish his wife Judy's shoes, feed Dog... you get the (slightly embarrassing) picture. 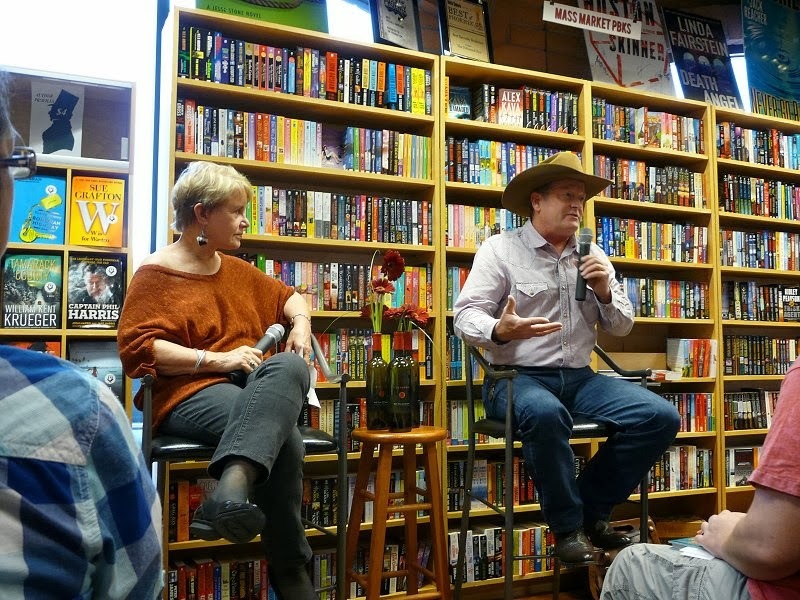 Since this wasn't my first rodeo, I knew to get there well in advance because when Craig Johnson is in town, it's Standing Room Only. As soon as the chairs were set up, I made my move and got my seat. I hadn't been reading for very long when an older (only in years) lady sat in the chair across the aisle from me, and we struck up a very enjoyable conversation. Then another woman who'd sat behind me at a previous author signing sat down, and we were off to the chat races. 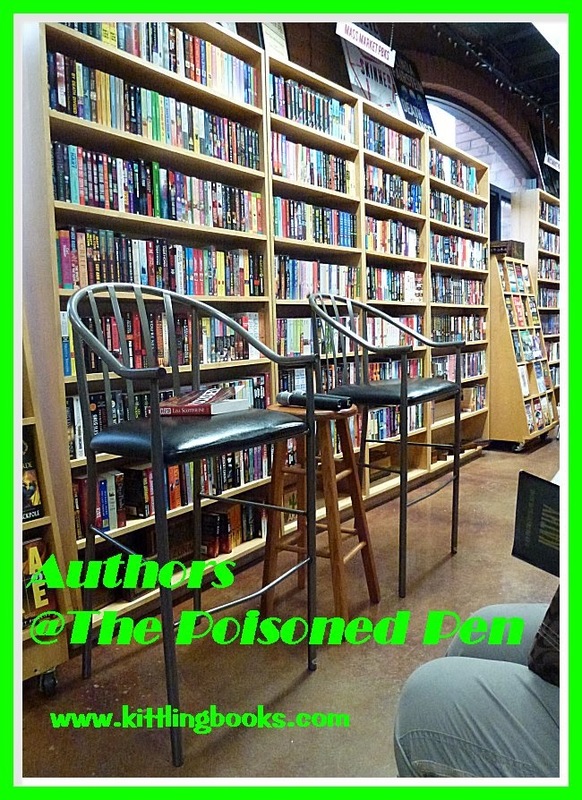 One of the best things about these events at The Poisoned Pen is that the more you attend, the more familiar faces you see, the more great book conversations you have, and the more friends you make. Am I lucky to live so close to such a wonderful book mecca? You'd better believe it! "There are 5 times more people here than in Ucross!" As soon as we slapped eyes on Craig, the whole bookstore erupted in applause. After our hands wore out, Craig told us that he doesn't charge any sort of honorarium whenever he appears at a library in Wyoming, but he does it so often that some librarians began insisting that they give him one. Now Craig would rather have that money go to badly needed books and programs, but when those librarians wouldn't let up, he had a solution: a six-pack of Rainier Beer. The reason why he brought up libraries? 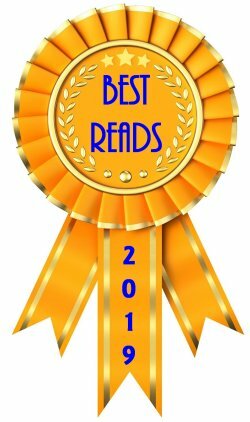 The Wyoming Library Association has named Spirit of Steamboat the inaugural Wyoming One Book state read for this year! Isn't that fabulous? Craig's learned that there's been a run on Rainier Beer since A&E began broadcasting its hit television series, Longmire, which is based on Johnson's series of books. A bar in a small town in Wyoming has been taking advantage of the episodes being televised twice on Monday nights by hosting "Longmire & Longnecks." Even all the ranchers are coming in, and when Craig didn't look impressed enough at this revelation, the bartender told him, "Hey, the last time something like this happened was for Gunsmoke!" This prompted host Barbara Peters to comment about Westerns. In the 1950s and 1960s, Westerns were everywhere, headed by John Wayne on film and James Arness on television. Then with the 1970s, America began its long fascination with the anti-hero. Johnson nodded in agreement and added, "Now America seems to be ready for a contemporary straight ahead good guy." What he didn't have to say is that we seem to be finding that "straight ahead good guy" in Sheriff Walt Longmire. Craig Johnson has been asked over and over again why Walt is so big. There's a very good reason for that. In most remote rural counties, a police officer is on his own. The counties don't have the budget to have them travel in pairs. Johnson wanted his character to be big enough to walk in on a bar fight, have the fighters take one look at his size and say, "That's it. We're done." But Walt's size was causing a problem in Hollywood. "Everyone in Hollywood is five foot four," Johnson said with a grin, prompting Barbara Peters to add, "Lee Child believes everyone in Hollywood is a midget." Thereupon we all took a few minutes to discuss the folly of Tom Cruise portraying Lee Child's Jack Reacher-- a character who's six foot five. "You're not really Australian, are you?" "Yes, I am, and I can tell a New Zealand joke to prove it," Taylor replied. Taylor's screen test involved notifying a woman of her husband's death. He did one tiny (telling) thing that none of the other actors did: he took off his hat. Johnson caught it immediately and told the others, "We don't need to teach him basic civility." The cast of Longmire showed up in a tiny northern Wyoming town this past year, and 10,000 people showed up. Robert Taylor autographed everything he was handed non-stop for four hours. Now these actors are on a pretty tight leash... err... schedule, and after that four hours, Taylor was due someplace else. Four police officers arrived to round him up and take him to the next stop. Robert Taylor stood up, looked the policemen in the eyes, and said, "These people have been waiting for four hours to get something signed, and I'm not leaving until they all do." All the policemen disappeared. "We never got to see Roy Rogers kick down the door of a crack house." Barbara Peters mentioned the fact that Craig Johnson is wildly popular in France. Johnson attributes his popularity to a good publisher and good translations and then moved right on to Spirit of Steamboat. Spirit of Steamboat is a short story that grew into a novella. His publisher was thinking along the lines of a digital Christmas special, but as Johnson began to write, the pages began to mount. His publisher didn't mind a bit. "But wait-- there's more!" Johnson exclaimed, and then went on to do a first-rate impersonation of Ron Popeil of Chop-O-Matic and hair in a can notoriety. Craig loved doing research for his novella. He got to hang around a group of old World War II veterans and go on a flight. A veteran named Bill made no move to board the old plane. "You're going to miss the flight, Bill," Johnson said. "The hell with you. I flew on those in the war, and I know how dangerous they are. Have a good flight!" Bill replied. Johnson had plenty of food for thought as he climbed aboard! Any Other Name is the title of Craig Johnson's next book, for all you fans who keep track (like me). A sheriff's investigator in Campbell County commits suicide, and Walt is asked to look into it. As Craig explained, it gets Walt out of Absaroka County so the death toll doesn't rise any higher there. Even more good news is that he's written two to three chapters in the book following Any Other Name. "The more you know about my personal life..."
A question that Johnson is asked a lot is why Vic is from Philadelphia. It's because Craig's wife Judy is from there. "You don't want to be around our house when the Eagles, Phillies, or 76ers play. You'd hear language you've never heard before. There's just a certain sort of viciousness in Philadelphia that I love," Craig admitted. When asked if he was involved with the Longmire television series or not, Craig replied, "I'm the Executive Creative Consultant, which means that I know where the Porta potties are." (He does a lot more than that, folks, like reading and checking all the scripts.) Another fan in the audience said that he was waiting for the Sheriff of Absaroka County to come to Jackson Hole. "I don't know about that," Johnson said. "That's kinda high rent for Walt." Any time Johnson needs information about horses, all he has to do is check with Buck Brannaman, the horse whisperer, who has a ranch about 25 miles from Craig's, and Craig's best buddy Marcus Red Thunder is "the living embodiment of Henry." Speaking of Henry Standing Bear, Johnson has a story about the actor who portrays Henry in Longmire, Lou Diamond Phillips. Marcus Red Thunder was taking Phillips around Billings, Montana, and every time Marcus spoke to someone, he called them by name-- airport, cab drivers, waitresses, everybody. Phillips was impressed. "Do you know everyone in Billings?" Phillips asked. "Yeah, everyone who wears a name badge," Marcus replied. Another fan mentioned George Guidall, the actor who narrates all the Walt Longmire audiobooks. 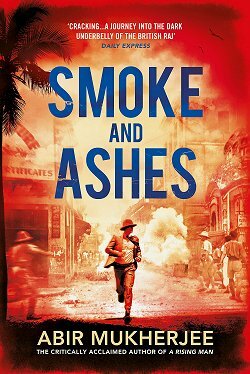 Craig agreed with the excellent job Guidall does, reminding us that he also narrated all the audiobooks for Tony Hillerman. 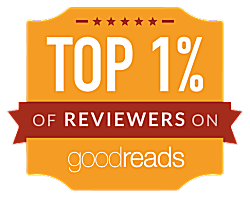 Johnson took a minute to remind us to sign up for his Post-Its newsletter because all those who are subscribed will receive a free Christmas Eve short story in their inboxes. And... remember what he said about the more we knew about his personal life....? Guess what his granddaughter's name is? You got it. Lola! There was time for one more story before the signing line began to form. Craig was in a restaurant in Red Lodge, Montana, wearing a baseball cap with the "Sheriff of Absaroka County" embroidered logo on it. Bending down to write a check, he heard a woman's voice ask, "Where'd you get that cap?" Looking up, he saw the voice belonged to a police officer. Envisioning various sorts of legal ramifications, he looked at the officer and said, "It's not a real county." The woman gave him a look and stated, "Like hell it isn't. That's Walt Longmire's county!" 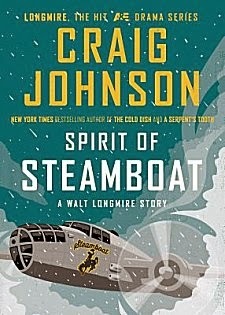 I got my hands on two copies of Spirit of Steamboat while I was enjoying listening to Craig Johnson at The Poisoned Pen. 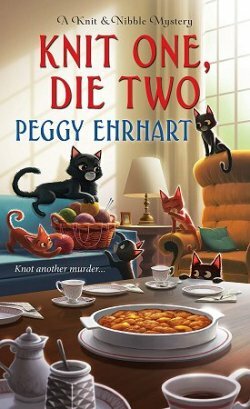 One of them is mine-all-mine, of course, but the second copy is for one lucky person who follows the easy rules on my Spirit of Steamboat Giveaway post. The drawing is on Monday, November 11, so don't delay! Cathy - Oh, a double-dose of Craig Johnson! Who could resist! I'm glad you had such a good time. 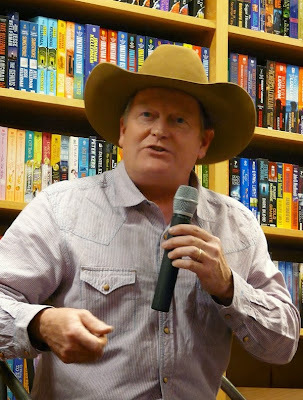 I always have a fabulous time when I go to see Craig Johnson! I have looked all over his Web Site and can not find a place to sign up for his newsletter! Help!!! (1) Click on "Contact" at the top of the page. (2 )Click on his email address in red, which will open a new email form. (3) Type "Craig Johnson Update Request" in the subject line of the email. (4) You don't have to type anything in the body of the email, but I added some fan-type gushing in mine. You'll probably get a reply the next day from Craig, just like I did. I swear I don't know how the man finds all the time he does to keep his head above water! If this doesn't work, let me know!